To celebrate Father's Day in the United States, the Huffington Post posts a piece on what "Father's Day" means for gay dads around the country. From Gay Dads Australia to all the Gay Dads and their families in the USA and around the world - have a Happy Father's Day and celebrate the strength and love of your families. 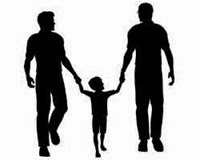 This week in the Huffington Post Gay Voices RaiseAChild.US “Let Love Define Family” series, gay fathers from around the country tell us about their Father’s Day plans and memories, and what this special day means to them.